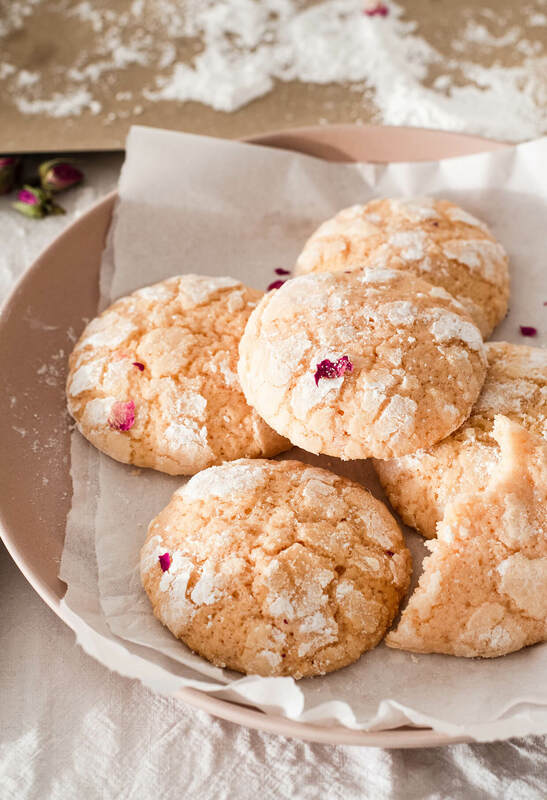 With a spring twist on the popular chocolate crinkles, these rose water lemon crinkle cookies are bound to become a household staple. 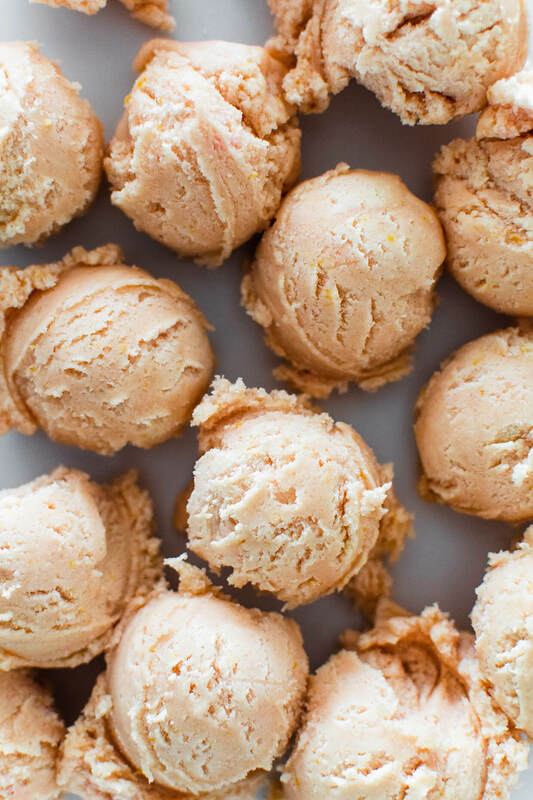 They’re fresh with a little bit of tang, crunchy on the outside with a buttery tender middle. We’re diving deep into Spring with this recipe. Meet the super fun cousin/sister/bff of the classic chocolate crinkle cookie: Rose water lemon crinkle cookie! 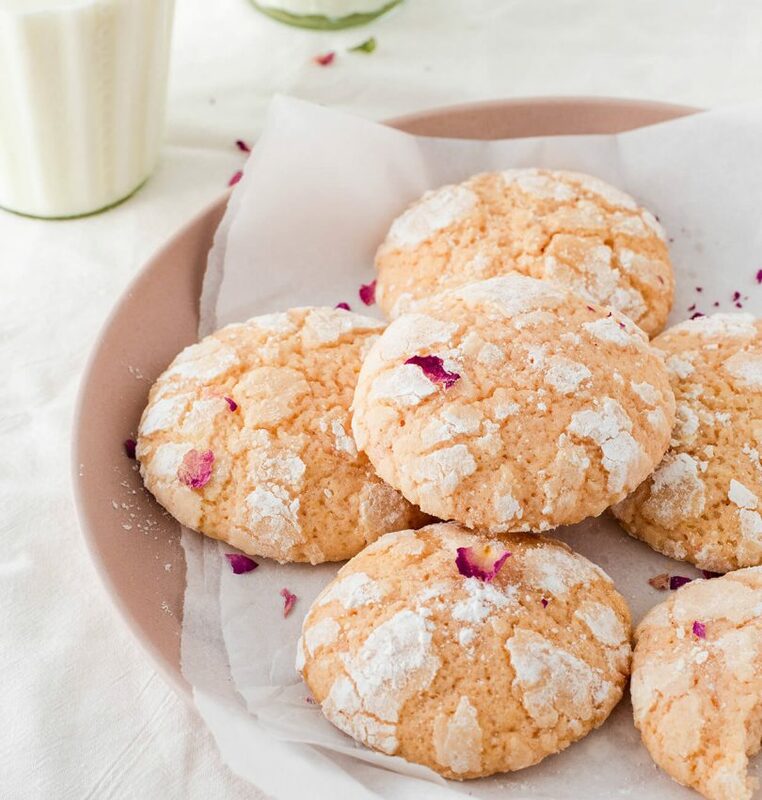 Not saying that these aren’t great winter cookies too, but the sun’s out and I can just feel spring in the air, so what better way to celebrate that than with these rose water lemon crinkle cookies? These truly are the millennial sisters of the chocolate crinkles. 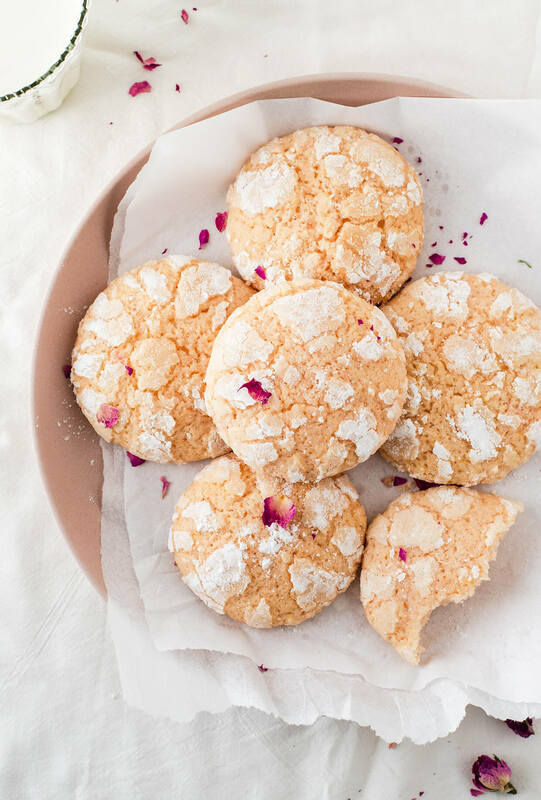 As much as I hate the overuse of the term “millennial” and all the millennial pink talk… I made you millennial pink cookies, well kind of. Visually you can see these have the same crunchy crust as the chocolate version does, with islands of sugar spread all over. I made these a bit big, so the sugar is more spread out, but that does not affect the flavor. The crunchy shell hides a tender, melt-in-your mouth center that’s both sweet and tangy. 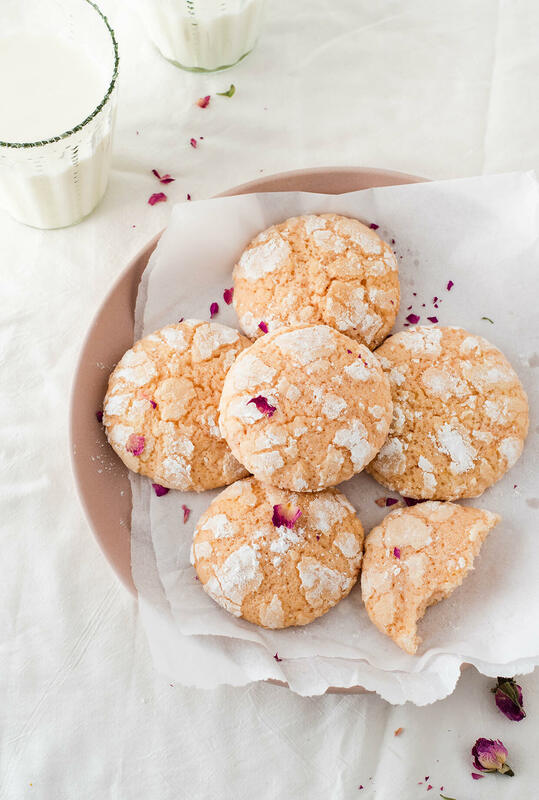 Now I’m sure you’ve already guessed that these rose water lemon crinkle cookies are a polar opposite of the chocolate crinkles. For one, they are made with zero chocolate. Instead I’ve put a lot of lemon into these. We have fresh lemon zest, which gives the cookies a nice tang. Then we have the lemon juice for a whiff of freshness. And then there’s the lemon extract (or oil) which takes these to the next level. In all honesty, the lemon extract is optional, but for a truly lemony cookie, I think we need to add some. And as if that wasn’t enough, I added rose water. This is the cherry on top. 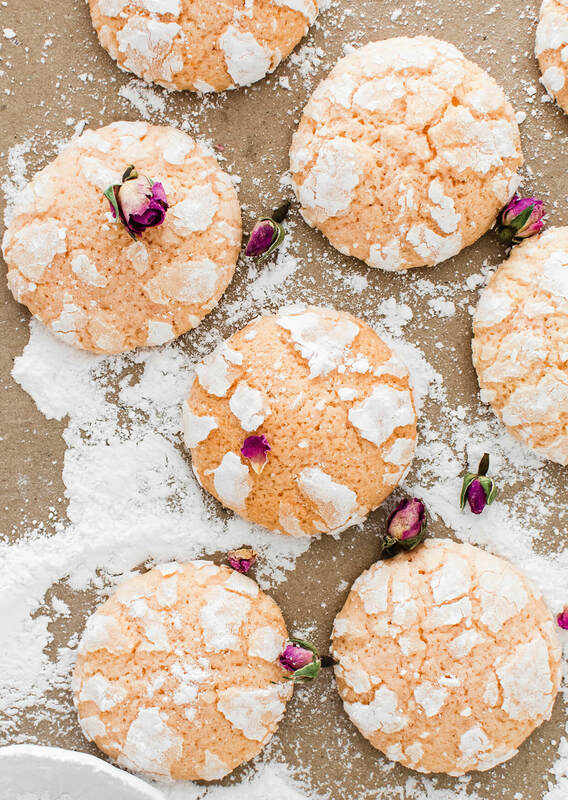 Its floral notes make these cookies airy and fresh but comforting at the same time. The delicate rose aroma leaves such a cozy taste, I could never get tired of it. I sometimes don’t tell people I used rose water, not right away at least. And so far everyone has had the same reaction: they absolutely love the cookie (or cake), but they can’t figure out why. They know that something’s different, good different, but what?? It’s the rose water! You don’t want to add too much and make the cookies perfumy, but a little dash goes a long way and makes the biggest difference in the end. One thing I need to mention as well is that I did add a dab of pink food coloring to these. Naturally, the cookies would be yellowish, but I wanted a peachier, rosier color and a tiny amount of pink gel did just that. I know they have a bit of a long name, but the recipe is as simple as they come. The cookies come together in no time and are really easy to roll and bake. My favorite thing is that the dough can be made ahead. I even prefer to chill it overnight, although it’s not necessary to do that. As long as you give it time to harden a bit, that’s perfect. And the baked cookies last really well for up to a week (possibly more) without losing any of their quality. I just can’t keep cookies for longer than that, haha. And these are such a treat, it would be really weird if they lasted any longer. I am in love with their smell and their flavor. First, my kitchen smelled like strawberry lemonade as they were baking and second, the minute I bit into one I just wanted more. They’re floral, citrusy, tangy and cute. Basically magical. 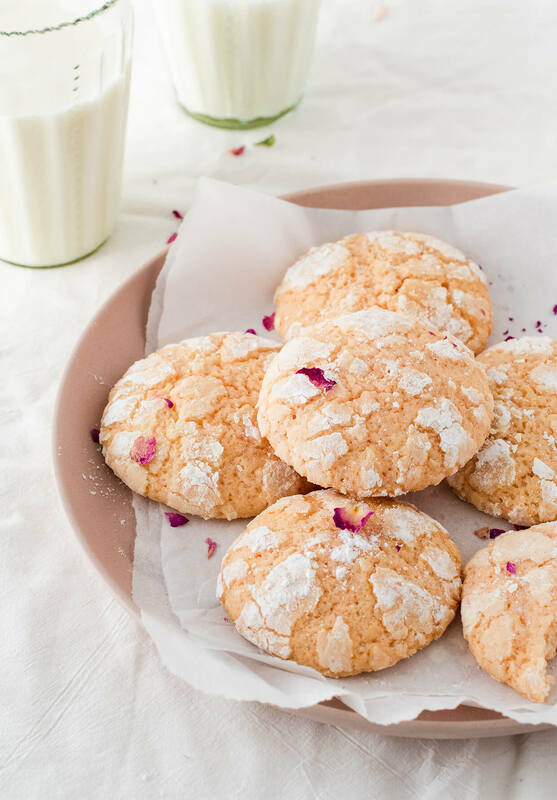 Refreshing crinkle cookies, perfect for spring! With notes of floral rose water and tangy lemon zest, they are very impressive. Sift flour and baking powder in a bowl and set aside. In another large mixing bowl, cream butter and sugar together. Beat in eggs until creamy, then whisk in lemon juice, zest, extract and rose water. Add food coloring if desired. Add the flour gradually while beating mixture on low speed until flour is completely incorporated and the dough smooth, be careful not to overmix. Cover bowl and refrigerate for 2-4 hours or overnight. The dough needs to harden a bit before you can roll the balls. Preheat oven to 350°F (175°C), line two baking sheets with parchment paper. Remove dough from the refrigerator and roll it into 1-inch (2.5-cm) balls. 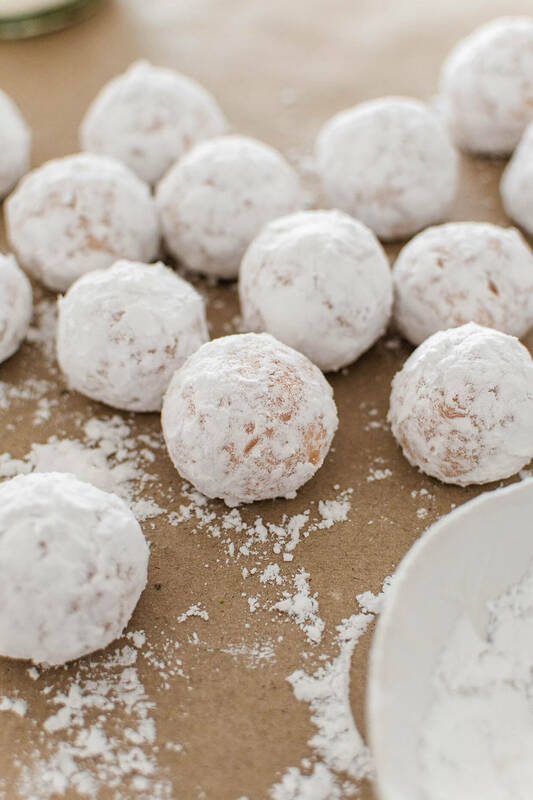 Roll each one in powdered sugar and place on the baking sheet, about 2 inches (5 cm) apart. Bake in preheated oven for 10-14 minutes, until cookies are cracked on top, don’t look raw anymore and their sides are hard to the touch. Cool on baking sheet for a few minutes, then continue cooling on a wire rack. Store leftover cookies in an airtight container at room temperature for up to a week (we haven’t been able to keep them beyond that). I baked my cookies for exactly 12 minutes, but I feel the 10-14 minute range is best for these, depending on the actual size of your cookies. I used a medium cookie scoop that has a volume of about 2 tablespoons and makes 18 cookies.